One of my first bands was called Lightly Toasted Touché. In 2004, we decided to book our own summer tour. I had the idea to put together a snail mail campaign that involved sending letters out to churches to let them know who we were and to ask for bookings. I was fortunate enough to find a huge database of churches online, and took full advantage of that. When all was said and done, we had nearly 200 letters to send out to churches across Canada, and something ridiculous like 1,500 letters addressed to churches in the U.S. As you can imagine, this was no small undertaking (we spent a lot of time stuffing envelopes to say the least). From our Canadian campaign, we got a total of three responses; one negative, one indifferent, and one positive. First, here’s the negative response we got. Our letter was torn and returned to us with this note on the back. The churches are not open for service (?) here as people are mostly few elderly & can’t afford to keep up financially and church is closed + we do not like rock & roll music it’s not sacred music. The band is looking to play churches, schools, community halls, lounges, outreach events, backyard shows, church services, and just about any event that requires a band (it may be beneficial to plan an event around the band’s performance). We ask sincerely that you would forward this letter to anyone you think who would best be able to help us (i.e. pastors, youth pastors, church councils, booking agents, etc.). 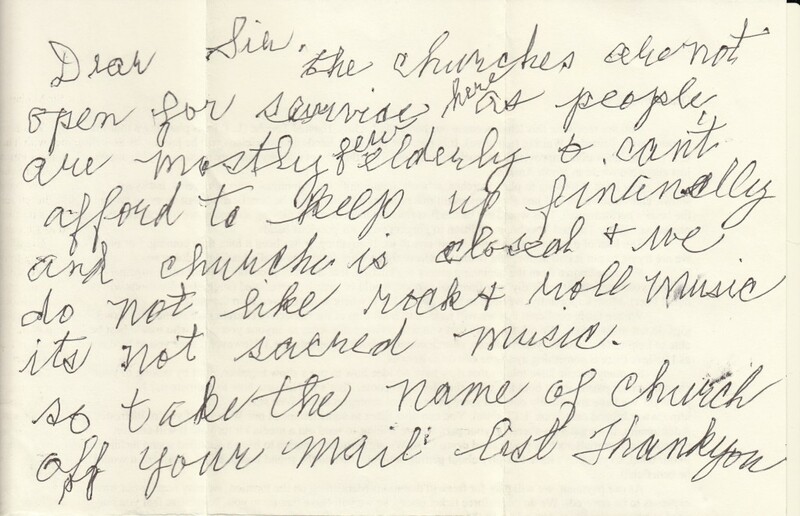 Considering their population is 150, I guess it would be relatively easy to figure out what church it was, but it’s still a little puzzling as to why they even bothered to send a response except to say “rock & roll music it’s not sacred music”. As for the indifferent response, it was from a pastor of a church I used to go to. Enough said. Finally, the positive response. We had someone from BC, Canada that was interested in booking us. It never panned out, but at least we got in touch and started building the beginnings of a friendship. Yeah, this was a slight oversight to say the least. Despite all the effort we had put into writing the letters, signing each one, addressing all of the envelopes, and even purchasing a custom stamp that we used for the return address on the envelopes, monetarily, we couldn’t justify sending out so many letters to the States. As you can imagine, it costs a little more money to send letters to the States from Canada compared to domestically addressed mail. Of course, the sheer quantity made it an expensive proposition as well. Our efforts may have been a little misguided, but we still learned some important things from this experiment. Firstly, postal campaigns can be effective, but if you want them to work, you must be a little more strategic than we were. We weren’t reaching out to people we knew, and our letters were not addressed to anyone specific. In retrospect, the letters were probably too long too. We had no idea whether the churches we were reaching out to would even be interested in booking us. We didn’t check to see whether any other artists or bands were being featured at those churches. Secondly, you must budget for snail mail campaigns, especially if they are of a larger scale. You probably gathered that much already. Thirdly, you can’t take rejection too seriously. Not to say that LTT went on to become a massive success, but we certainly did play a number of gigs (some of them actually paid), and gained a little bit of notoriety for our music. They were modest beginnings to be sure, but the promise of something better was lurking around the corner. Several years later, the original members of the band – along with a new lead singer – got back together to form Angels Breaking Silence, and though we never “toured” per se, we did play many out-of-town shows and enjoyed considerable success thanks to our well-managed financials. Rejection can catch you off guard. It often comes when you’re least expecting it. But it’s not something to be dwelt upon. I have found that if you don’t catch negative thoughts early and consciously choose to change your mind, you can quickly go into a downward spiral, and that’s an unhealthy way of dealing with it. 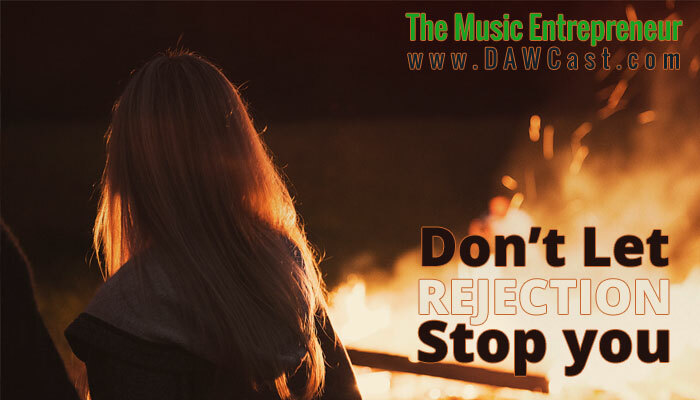 More than likely, you will experience some rejection on your journey. Just remember that even The Beatles had critics, so there’s really nothing wrong with being rejected. It’s all about how you respond to it.